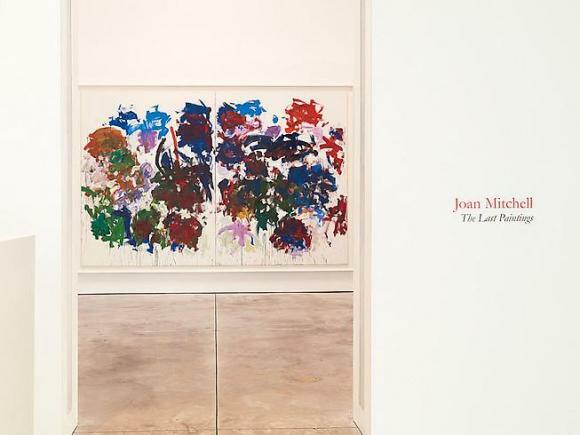 ﻿Cheim & Read is pleased to announce an exhibition of late paintings by Joan Mitchell. The show brings together 13 works, dating from 1985–1992, that represent Mitchell’s exploration of painting in the last decade of her life. The exhibition is accompanied by a full-color catalogue with a text by Richard D. Marshall. Joan Mitchell (1925–1992) moved from Chicago to New York in 1947. Early in her career, she was included in the historically significant 1951 Ninth Street Exhibition. Organized by Leo Castelli, the show was renowned for its championship of Abstract Expressionism, and positioned Mitchell with older, mostly male painters: Willem de Kooning, Jackson Pollock and Franz Kline among them. Mitchell met de Kooning early on—inspired by his painting, she sought out an introduction—and was a rare female participant in artistic debates at the notorious Cedar Tavern. In 1952, she had her first solo exhibition at the New Gallery.